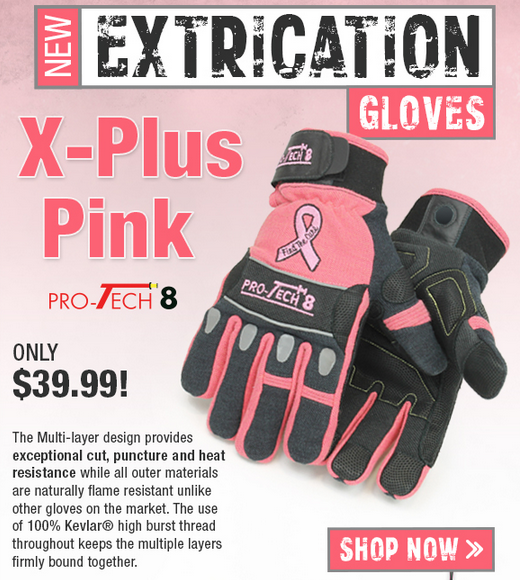 There's no secret that Pro-Tech 8 makes some of the most high performance, highly protective gloves on the market, and now you can own them in TheFireStore Exclusive PINK. 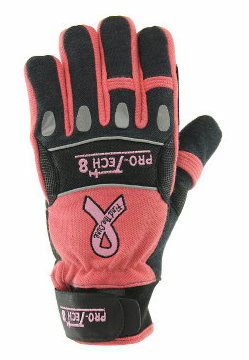 The unique, new gloves have a pink ribbon reading, "Find the Cure" so you can show your support for Breast Cancer Awareness and perhaps someone in your life who's fighting the fight, or to show tribute to those you've lost. While these gloves may be pink, they won't be lacking in any key features, oh no. They're made with a high quality knitted kevlar with a modacrylic cuff and hook & loop. They're made of flame resistant 50% kevlar and 50% modacrylic outer layer with a rubberized kevlar knuckle guard. The digitized, padded leather reinforcement layers make sure that you have excellent flexibility while having utmost protection. While the durable rubberized Kevlar palm is water resistant and reinforced with digitized leather. The unique design with the multi-layered, flexible Kevlar, combined with the neoprene and silicon carbide makeup the glove's unique knuckle guard system. All of these great features are what make the safety and protection feature of this glove top knotch. The Pro-Tech 8 gloves are designed specifically for hand protection during structural firefighting activities and made with component materials that will withstand the effects of flame, heat, vapor, hazardous liquids, sharp objects and other hazards encountered on the scene. So next time you find yourself gravitating towards a pair of Pro-Tech 8's, check out the new TheFireStore Exclusive X-Plus Pink. Shop these and other Pro-Tech gloves here.